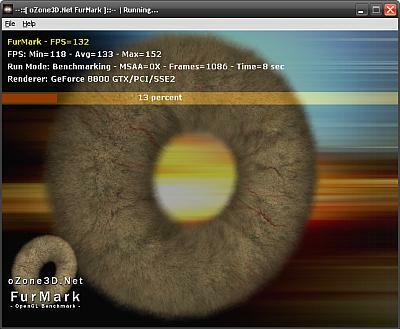 FurMark is an OpenGL benchmark that heavily stresses and overheats the graphics card with fur rendering. The benchmark offers several options allowing the user to tweak the rendering: fullscreen / windowed mode, MSAA selection, window size, duration. The benchmark also includes a GPU Burner mode (stability test). FurMark requires an OpenGL 2.0 compliant graphics card with lot of GPU power! New: added full QXSGA mode: 2560×2048. New: added an extreme burning mode for stability test. This mode available in command line: /xtreme_burning Launch FurMark-Xtreme-Burning.bat. New: added command line parameters (see the start-Benchmark-Standard-Mode.bat file for parameters list). Now you can control FurMark’s resolution, msaa level, CPU affinity, etc., using command line. Change: time in score dialog box is now in milliseconds. Known issue: under Vista with ForceWare graphics drivers (tested with 169.28 and 175.16), if the desktop resolution is equal to benchmark selected resolution, the swith back from fullscreen mode to windowed mode (at the end of the benchmark) fails and the user can’t see the score dialog box. This issue has not been observed with Catalyst or S3 graphics drivers. Anyone through some light on this? is there any development going on? Hi, it’s on my plans but I don’t know when. But as soon as start the Linux version, I’ll keep Geeks3D readers informed ;). Do you know well the Linux environment? We need the Linux version! And now, whats about the Linux Version? Any new News for us? Any progres on the Linux version yet? a Linux version would indeed be great.